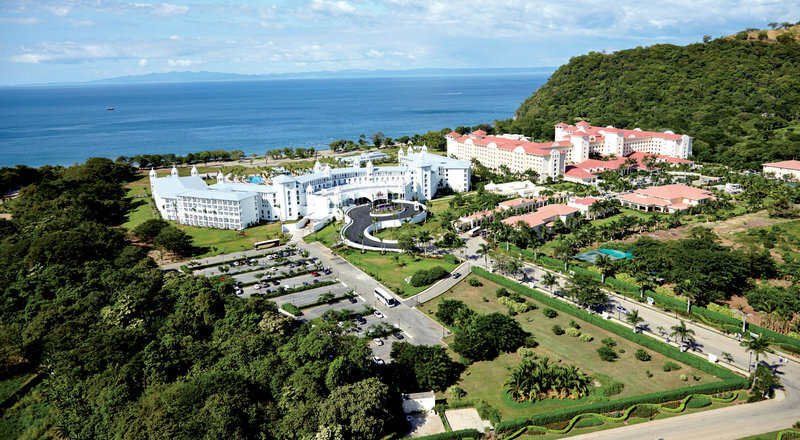 In 2013 Apple Vacations awarded this hotel with the “Best Staff & Service” Chrystal Award resort in Central America.The Hotel Riu Palace Costa Rica is located in Guanacaste, Costa Rica on the edge of the beach of Matapalo. The four swimming pools (one with a wet bar), jacuzzi, gym, sauna and a wellness center “Renova Spa” with different treatments and massages for you to pick from. Being on a privileged environment, the hotel offers a variety of activities on the beautiful beaches such as diving or fishing in the Pacific waters, ecotourism in the volcanic areas,and during the day several programs of entertainment for all ages. The kids mini-club for ages 4-12 the staff will keep your children occupied as well they will make many new friends The hotel has table tennis, volleyball, tennis court,windsurfing, sailing, snorkeling equipment, kayaks and other water activities. If your favorite sport is golf, the Four Seasons Golf Club has fantastic views over the sea and is nearby. In the evening there is live music as well shows for your entertainment or you can dance the night away at the Pancha nightclub or the casino (drinks not included).If your stay is for work purposes, then the Hotel Riu Palace Costa Rica will be perfect for you. It has five conference rooms, modern and fully equipped so you can conduct meetings or events in a professional and simple way, well as various services that you will be able to request. The quality of the cuisine offered at the buffet restaurant, ice cream parlor or the four different theme restaurants of the hotel is exceptional thanks to our chefs, who prepare a variety of dishes, from classic to the most exotic. For breakfast, lunch and snacks: free choice from a selection of restaurants at the Riu Palace Costa Rica and Riu Guanacaste hotels. Room service 24 hours a day, snacks 24 hours a day, Krystal” Fusion restaurant, “Tokio” Japanese restaurant, L’Anfora” Italian restaurant (buffet starters), “Papagayo” Grill and steakhouse. Along with 3 bars/Lounge 24 which is open 24 hours and a pool bar. The complex has 538 rooms and suites, each room has a living area with a sofa or sofa bed, hydro massage bathtub, stocked mini-bar, liquor dispenser, safe, free Wi-Fi and balcony or terrace. Courtyard and ocean view junior suites, two bedroom family suites and Jacuzzi ocean view suites are available.